In a progressive intervention to the flagship welfare legislation, the Supreme Court on Friday ordered implementation of new wages under the Mahatma Gandhi National Rural Employment Guarantee Act (MGNREGA), effective since April 1. A bench of Justices S J Mukhopadhaya and S A Bobde passed this order thereby disposing off the Centre's appeal which said that implementation of the new wage structure as per the February 13th notification had rendered the petition infructuous. The UPA government had on February 13th, notified new wages for states which saw the wages increase by 16.6% to Rs 153 a day in Bihar while in Jharkhand it went up by 14.9% to Rs 158. Wages in Andhra Pradesh, Mizoram, Nagaland, Sikkim and Tripura were also increased by 14.8%. The Centre had preferred a Special Leave Petition against a Karnataka High Court verdict which said that the Union Government was liable to pay higher wages under the country’s premier rural employment programme in consonance with the allocation of wages as per the state’s minimum wage rate. The Apex Court categorically directed the Government to find a way out and end the disparity between the wages paid under the MGNREGA and State mandated rates under the Minimum Wages Act. Despite the annual increase in wages under MGNREGA since 2011, minimum wages in more than a dozen states continue to be high and this was also the rationale adopted by the Karnataka High Court while directed the Centre to pay MGNREGA wages in accordance with the Karnataka State Minimum Wages Act. The Centre had preferred an appeal against the High Court order in the Supreme Court, but in January, the Apex Court refused to stay the High Court order saying payment of minimum wages was mandatory under law. 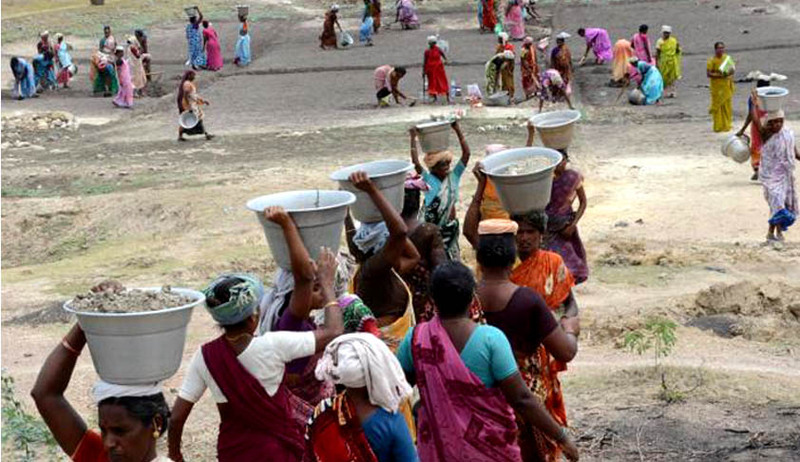 This had compelled the UPA government to revise the wages under MGNREGA. While passing the order, the Bench kept open the question- should states pay minimum wages as provided under the law while implementing MGNREGA?..and further went on to hold that if any challenge was made to the notification, then the court concerned would decide it on its own merit uninfluenced by the Karnataka High Court judgment. During the resumed hearing, it was argued by the Government that the Centre had already revised the wages from February. Taking note of this, the Bench asked all the States and Union Territories to pay wages to MGNREGA workers as per the schedule of wages in the February 13th notification. When the State Counsel for Karnataka, pointed out that even the revised wages was less than the minimum wages in some states, the Bench said they had the liberty to challenge the notification and to move contempt petition if the arrears are not paid. When the national job scheme was started in 2006, the minimum wage for agricultural labourers in each state was taken as the standard wage for MGNREGA workers. However, in 2008, the Centre decided to revise the MGNREGA wage rate by indexing it to consumer price index for agricultural labourers. The revised wages, as specified in the February 13th notification and effective from April 1, are estimated to cost the exchequer an additional Rs 1,000 crore. The paltry Rs 353 crore increase on last year's Rs 33,000 crore budget allocation for implementation of MGNREGA may not fit the bill anymore as the same might not be enough to implement the rural employment guarantee schemes. Regardless, the Apex Court has given a ruling which aims to eliminate disparities between two avenues of payment for the daily wage labourers; thereby intending to enhance the effectiveness of the flagship programme.